This modern Safavieh Courtyard area rug will instantly improve any room you place it in. Decor done right with this indoor/outdoor piece, and its plush synthetic material. Modern style and construction is combined in this machine-made rug. This blue rug has a fashionable geometric pattern to add some flair into your home. Break up the monotony of an outdoor or indoor expanse with the Courtyard Navy/Beige Area Rug. This resilient 8 ft. x 11 ft. throw rug is built to withstand heavy foot traffic and exterior elements, perfect for a patio, porch, deck, sunroom or anywhere in your home. It has a soft, cushiony feel and rich colours to transform the way your space is used and appreciated. The Safavieh-developed sisal weave allows the rug to be hosed down for easy upkeep. Place this contemporary Safavieh Courtyard area rug in your home for a piece that makes a statement. Bring this high quality plush synthetic indoor/outdoor rug into your home to upgrade your interior design immensely. This machine-made rug makes long-term decorating easy. Include this geometric patterned blue rug in your living spaces for a high quality and high fashion look. 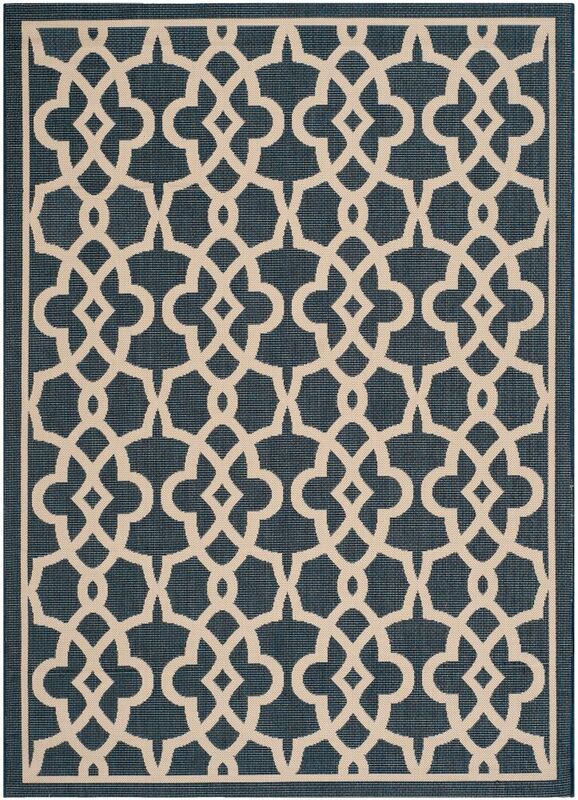 Courtyard Jane Navy / Beige 8 ft. x 11 ft. Indoor/Outdoor Area Rug This modern Safavieh Courtyard area rug will instantly improve any room you place it in. Decor done right with this indoor/outdoor piece, and its plush synthetic material. Modern style and construction is combined in this machine-made rug. This blue rug has a fashionable geometric pattern to add some flair into your home.